Introduction to language contact phenomena, with case studies illustrating a variety of language contact situations. 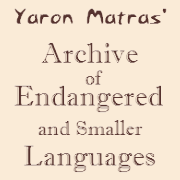 Information and sound samples from over a dozen endangered languages. Visit the Romani Project site for in-depth information on hundreds of dialects of Romani, each with its own language contact situation. A pilot survey of the Kurdish dialects of Iraq.